It's two successive days now that I've been having difficulty riding the Metro Rail Transit (MRT). Ah! The queue was just exhausting. I know people would rather ride the MRT to get to their destination faster rather than ride the bus and get stuck in traffic. 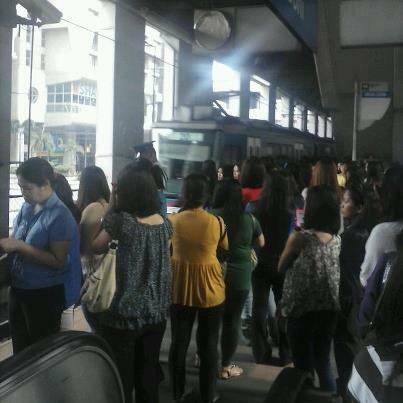 It looks like MRT is no different from the bus as a means of transportation nowadays. I pity those who are in a hurry and maybe late for work or school. The government should really look into this now. It's affecting a lot of people already. And it's getting dangerous because when a train arrives, passengers tend to push and shove others just so they can get a ride on the train. Sometimes you have difficulty breathing inside the train because it's overly crowded. Sigh. I'm still grateful that I only have to deal with the rush hour and the crowded train on my way home from work. Not the other way around.